Just got interviewed over at Graphic Hug. I am unsure if more appropriate and precise words have been spoken about the recent American election. I’m unsure what to do with this newfound sense of hope for millions of Americans. Wait for the new President to bungle, I imagine. 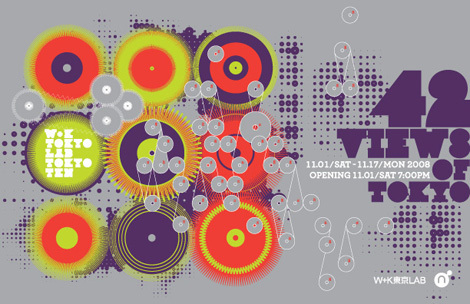 I have a video installation in Scion’s show at Art Basel Miami this year. If you are in the Sunshine State and looking for free booze and fine fine art, this is your place in early December. (Today’s Usugrow painting is tomorrow’s Dali!) Friday, 12/05 at the Raleigh Hotel Penthouse from 7PM-10PM. I’ll be there- hit me up! 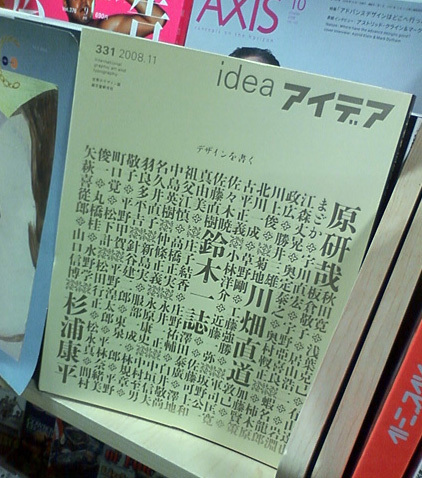 I have a lengthy essay about Gary Hustwit’s documentary “Helvetica” in the latest issue of Idea, on newsstands now. I just had an interview with Nagoya cutesters Lullatone go live on PingMag. 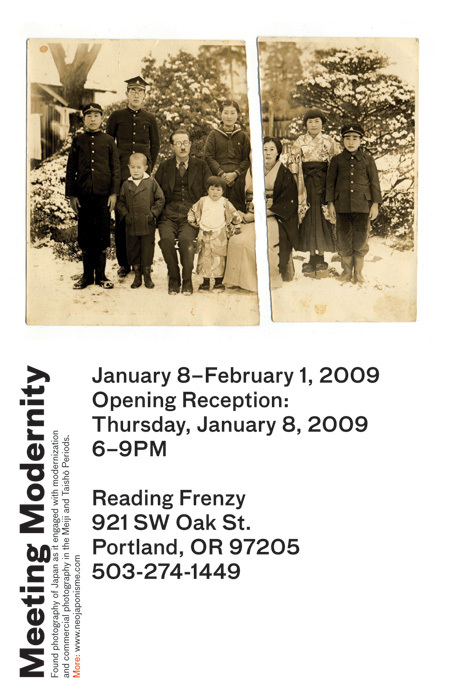 We had a number of really nice offset postcard sets made for the inaugural Meeting Modernity exhibition. There are 8 thick, full color cards in each set, wrapped in handmade, envelopes made by the tireless folks at Los Angeles’ Young Art gallery. 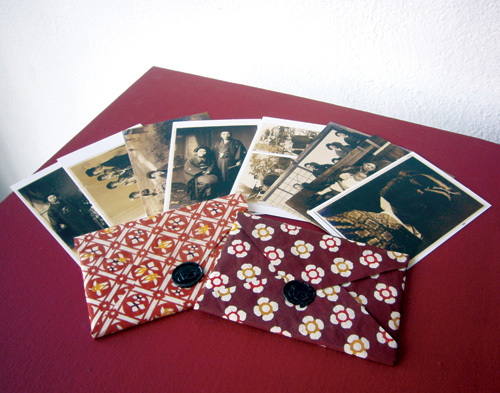 Card sets sell for ¥2200/$22 postpaid. Do us and the gallery a favor and pick up a set. I can’t tell you the stress it puts on me every second Tuesday having my recycling silently judged by local volunteers at the recycling drop-off point. One time I even got into a Kafkaesque argument over whether aluminium cans should be pre-crushed or not. If that woman had had the authority to call the cops on me for showing up with a bag full of uncrushed cans, she would have done it in a second. 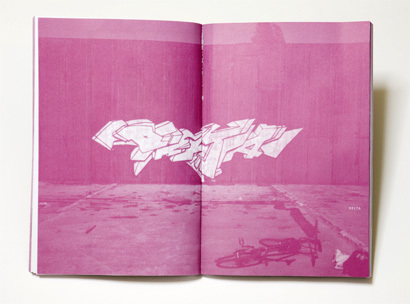 A comprehensive review of my now sold out book by Ricardo Cordoba is up on Speak Up. It’s a nice, solid piece of criticism. 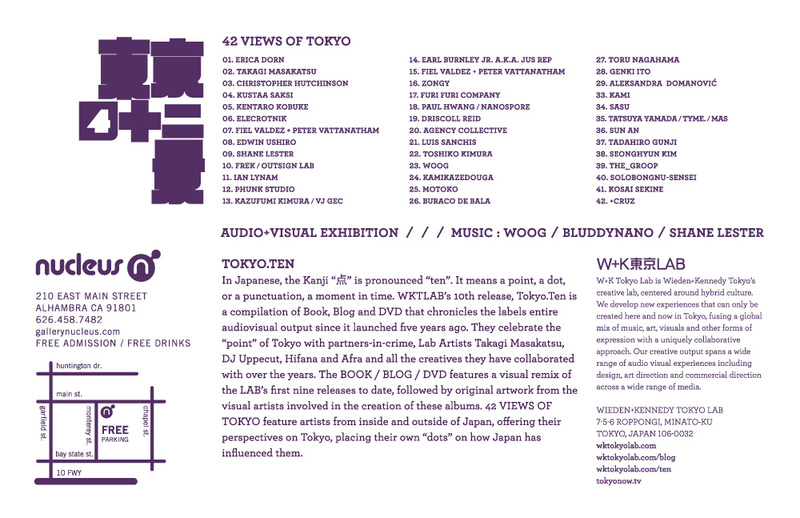 A new competition for Japanese artists who have practiced or studied in the UK. The competition is a form of research into a fluid ‘Japanese community’ in the UK and its ‘alumni’ by curator Helena Capkova. This competition is open to Japanese of any age, including students, graduates, and established artists. The competition is also open to any media including design. The only condition is contemplate the particular task of the competition. 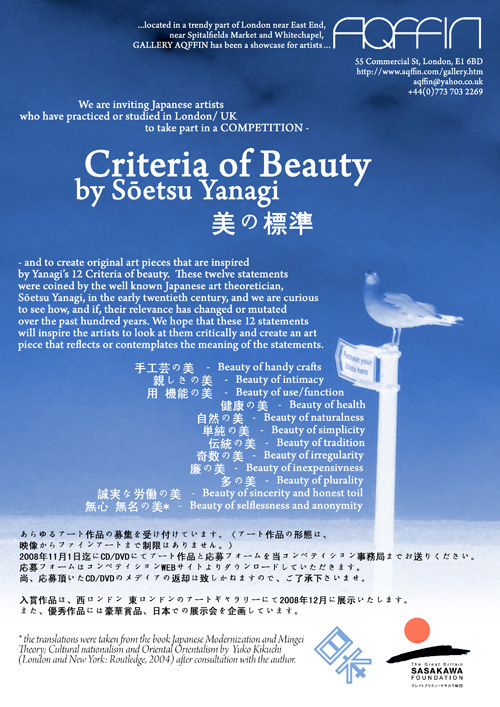 The competition invites artists to assess 12th Century Japanese art theoretician Soetsu Yanagi’s 12 Criteria of Beauty through the creation of original works of art. The application for the competition is here. The deadline is 1/11/2008. There will be small prizes, but the most important thing is to give exposure to people who would not otherwise exhibited in the competitive London art world. The exhibitions will take place in three places in London in December and January 2008/2009. 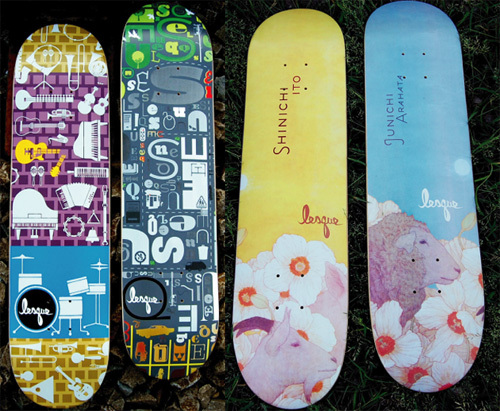 My first line of skateboards designed for Lesque, Tokyo’s hottest young skate company, is back from the plant. They may be available at your local skateshop if the Lesque boys don’t sell out on tour. Their “Couch Surfing” tour is pretty much the highlight of skate demos and culture in Japan this summer. If you have even the most remote interest in skating, go check them out. Seriously. Lesque is an interesting company in that they have eschewed the traditional Japanese business model of sucking up to a distributor for manufacturing/funding, choosing to handle management and manufacturing themselves in a similar style to D.I.Y. outfits like Dischord Records. Recently, one of their two pros, Shinichi Ito, got fed up with the minimal support offered by his supplementary sponsors and told them to take a hike. The result was this video. He is currently on the lookout for new sponsors (though Elwood already snatched him for clothing). I’ll be briefly introducing the team before their presentation at the next PechaKucha Night at SuperDeluxe on September 24.